After its Wi-Fi-only release form last month, the Samsung Galaxy Tab 4 8.0 is now on its way to AT&T in 4G LTE form. It will be joining the recently launched Galaxy Tab 4 10.1 in the carrier’s roster. The info has been brought by the FCC, which has just certified the affordable 8-inch tablet. 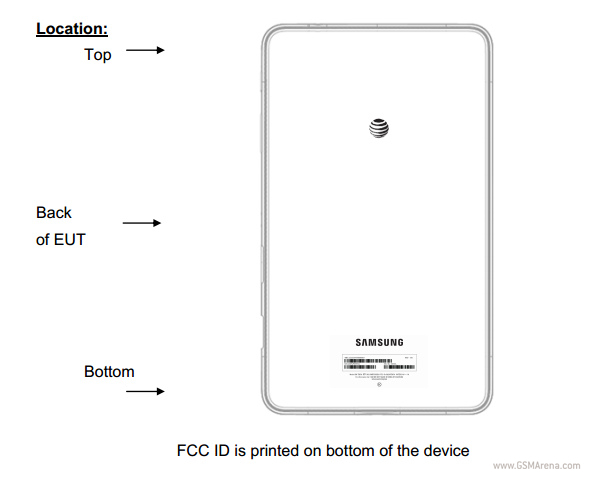 That process yielded a schematic of its back, where AT&T’s logo is featured in all its glory, leaving no doubt about the intended destination of the Tab 4 8.0. The model number for AT&T’s version of the tablet is SM-T337A, and there’s no reason for it to be any different in terms of specs to the international LTE variation. So you should expect to see an 8-inch 1280×800 pixel touchscreen, a 1.2 GHz quad-core processor, 1.5GB of RAM, Android 4.4 KitKat running the show, and a reasonable price tag attached. That said, it’s still unclear when exactly you’ll be able to pop into an AT&T shop and buy one of these. T-Mobile may also be getting in on the action, as a Samsung SM-T337T has been certified by the Wi-Fi Alliance, alongside the SM-T337V which is probably destined for Verizon.